It's true: I am, and always will be, somewhat of a perfectionist. And I definitely play the comparison game with so many other people—even when I try hard not to. Over the past couple years, I've thought a lot about how social media and the beautiful blogging world have influenced my own perfectionism—and (perhaps most notably) my happiness with the life I've been given and all the little things that surround me. 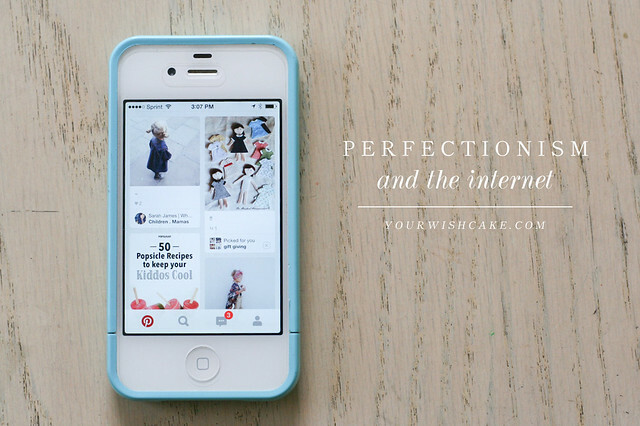 I recently heard someone speak on something coined Pinterest Perfectionism, and it definitely hit close to home. I remember when Pinterest first became a thing and I had absolutely no interest in it. Right away I was turned off by the idea of yet another social media platform vying for my time and attention. I was curious about it, but didn't come around to creating my own account for some time after first discovering it. It seems to me that some people can live and breathe Pinterest and take only the good, not experiencing anything other than happiness while scrolling through the beautiful photos, recipes, quotations, and hipster-tots. And to them, I say: God bless you. Because it seems to me that many women women end up developing some sort of complex or dissatisfaction with their own lives after consuming all the perfection in front of them—if not from Pinterest specifically, then perhaps from Instagram, an often-visited blog, or a favorite YouTube channel. But this is my story, and I can only speak for myself. I must admit that my social media and blog consumption has been reduced drastically in the past couple years. There are hardly any blogs I'm able to keep up with on a regular basis, I have a love/hate relationship with the Pinterest app on my phone (which I delete and reinstall many times throughout the year), am no longer an avid Twitter user, and although Instagram was one of the main reasons I was so excited to get an iPhone, I keep my account private and make sure to avoid it at all costs when I'm feeling particularly dissatisfied with some aspect of my life. As for Facebook, I haven't had an account in years and only miss it when my husband shares some tidbit of news that seems to have been announced exclusively on that specific social media outlet. This is all to say: I've finally learned my triggers and am practicing the art of avoiding them. For me, I don't find that crafts, parenting advice, overwhelmingly detailed birthday parties, or delicious (yet sometimes impossible to duplicate) recipes on Pinterest result in feelings of stress or inadequacy. But I recently had to make a great effort to unfollow every single home decorating or fashion/personal style board under the sun because oh, my gosh. When I fall into the abyss of overpriced cardigans, beautifully decorated nurseries, or back porches straight out of a home decorating magazine, let's just say it ain't pretty. I've learned that I simply cannot expect to consume a large quantity of these images without feeling like my life, my wardrobe, or my home is severely lacking. Yes, these are my triggers. Capsule wardrobes priced higher than my rent? Perfectly patterned wallpaper that makes me swoon? A newborn's nursery that costs more than life itself? Flawless hair color I will never be able to afford unless Great Clips seriously ups their game? A backyard garden complete with twinkle lights and a gazebo? BEAUTIFUL TAPESTRIES? $30 BABY LEGGINGS? DIY OMBRE PAINTED STAIRCASES? WHY DON'T I HAVE A OMBRE PAINTED STAIRCASE IN MY LIFE RIGHT NOW?! I'm not left feeling inspired; I'm left feeling bitter. When I definitely have no reason to be. Like I said: it ain't pretty. It's the same thing with blogs and Instagram. I have to constantly filter, filter, filter. There are weekends I stay off social media completely, and (somewhat unsurprisingly) those end up being the best for my heart and mind. There have been other times in my life when I had other specific triggers…photos of baby bellies would make my heart ache because I so desperately wanted another child. Seeing perfectly-posed photos of wives with their husband and kids made me think their lives were surely as perfect as those snapshots. Reading articles on working from home and creating a business while in the throes of motherhood that should have been inspiring, instead left me feeling inadequate and incapable. Recently, I saw someone mention somewhere (on social media, I'm sure) how they stopped paying attention to all the fitness models and perfectly-fit images of women out there on the internet these days. (On a personal note, I can understand how some people may be able to view these images as some sort of inspiration, but for me they simply represent an unattainable standard and bring nothing but negative feelings into my brain.) This woman made an intentional decision to start following people who looked more like her and who perhaps weren't cover-ready for Women's Health (but who the heck is, really, except apparently Gwenyth Paltrow?). After a short time, she was already feeling a huge shift in her own self-image. She could run out the door in workout gear that would have before made her feel self-conscious, but now she feels empowered—knowing how many other women out there are just doing their own thing with the amazing bodies they've been given. It made me think a lot about how much happier I am when I don't torture myself needlessly, spending even a fraction of precious time comparing someone else's life (wardrobe, husband, kids, living space, ability to bake gluten-free, organic garlic bread from scratch in 4 easy steps, etc.) to my own. It's hard enough to fight these feelings within our own smaller circles of friends in real life, let alone when you're faced with hundreds of people on the internet who you don't even know and will likely never know. Sometimes I envy the previous generations, who probably struggled with many of the same insecurities, perfectionistic-tendencies, and comparisons—but for them, they were only looking at the other women down the street, at their local mommy group, or sitting in the pew next to them at church. Now we're bombarded with so many images that feed into any feelings of, "Wait, am I doing this right? Am I enough? Do I measure up?" Clearly, we were not made for this. It's a constant battle, but it's worth it to be more intentional about what I choose to scroll through, read, or "pin" during any precious free time I have. Although some women may not need to create limits for themselves, I'm definitely one who does. It's good to remember that perfection is not the goal, you can't have it all, you can't do it all, you can totally make do (happily!) with what you have, and sometimes it's better to simply surround yourself with images and inspiration and people who are more like you (right now) and your own life (at the current stage, messiness and all). And a DIY ombre painted staircase would probably be too much work, anyway. Right? Right. Oh what a struggle it truly is. I completely agree with your decision to filter those things that trigger you, as I've felt relief from doing the same. After years of losses and infertility, I still struggle with new baby/belly photos, but not when they're posted by others who've experience infertility or loss in the past. (Which is silly because I would never wish it on those who haven't had to experience, you know? And it's entirely possible those that I believe have easy breezy pregnancies and experiences have had a hard time along the way, and I had no idea! I realize this...) I too have found myself unfollowing accounts that continually show extravagant vacations, homes, purchases, over the top gifts for children etc. (though I recognize my Stitch Fix habit is my own spendy issue...) I think it's really healthy to recognize what isn't good for your happiness and simply turn the volume down on it. I think that I've often struggled with the same thing you mentioned, too—worrying about how what I post will be perceived by others. Am I being too fluffy? Am I being too negative? Do I seem ungrateful? Do I seem genuine? But after a while I started worrying less, mostly because I've been accused of some of those things over the years and it's never for what I expect. Although I definitely have to filter what I say and share these days (mostly out of respect to my family and those close to me, keeping in mind the internet is so huge and you never know who is reading/watching) as long as I'm sharing from the right place and not just from any heightened emotion (especially when I'm feeling angry or jealous, or posting the perfect photo of a perfect moment just to get likes) then there's nothing I can do to control how other people respond. I definitely love following people who have a good balance of the perfectly-pretty and completely-honest, though…there's nothing like having someone you admire post a photo that shows something less than "perfection"! It is so refreshing, I tell you. You and I sound a lot alike. I haven't had a Facebook in months, I am rarely on Twitter and Instagram doesn't have much. Pinterest has been bugging me lately with what's being "suggested" to me. Half of the things they suggest I would never eat, buy, wear or try. They must not know me well enough. I have been a little discouraged lately when it comes to my blog. I used to be a big blogger and I racked up the views/comments/numbers so fast. After leaving for a year and coming back and trying to just jump back in is seriously disappointing me. Everything has changed. Like, in a bad way. But after being one of those big bloggers, I burned out quick and I honestly have nothing to talk about anymore other than my web design business or SOME vegan recipes. Other than that, I am feeling like giving up. Thank you so much for the sweet comment, Natalie! I hear you on the Pinterest thing—lately, there's a ton of things in my feed from boards that I don't follow, and they don't even say "promoted pins" or "suggested pins" so I have no idea what the heck is going on with that. Kind of annoying, for sure! It can't be based on things I'm searching for, because 90% of the time I'm searching for recipes. Ha! And I could talk for pretty much ever about how much blogging has changed over the past several years! I've been blogging for over a decade, so I've been able to see how the entire landscape has changed (which I'm sure it had to, but still). To be honest, there have been many times it has frustrated me so much that over the past few years I've been ready to quit and say goodbye to my blog over and over again. I definitely miss the blog world from 8 years ago, back when I posted nothing but stories and thoughts about life almost every day, rarely with photos and always without a care in the world. I finally decided to just start blogging consistently again, knowing that although it's simply not ok for me to spill intimate details about every aspect of my life at this point (30 is much different than 20, eh?!) that I could share what I wanted to share and make it less of a journal and more of a creative outlet. It's actually fun again, because although I do want to create content other people enjoy, I still make sure to post things that make ME happy. Plus, hopefully generating some income at some point is actually on my radar at this point, because I'm no longer a 20-something with all the free time in the world! And I must say, it's crazy how blogging used to be all about comments! I remember back in the day when you could tell your best posts by the number of comments, but now my most read posts have very few comments at all. I think that people are reading blogs differently now and maybe people are more rushed/overwhelmed by social media so they don't take time to comment on posts anymore (I know that's how it is for me). Just one of the ways the blogging world has changed oh, so much. I say keep going with it and see if your passion for it returns! If all you want to share right now is design inspiration and vegan recipes, I say have at it. It will be obvious that you're sharing what you want to share, and I believe that's what people want to see, anyway! Hugs, lady. In any case, I loved what you had to say and it totally resonated with me. Whenever women get down on themselves and how they look (myself included!) I always want to tell them to start filtering. Filter like woah. There's only so much we can do (there's no way to avoid those ridiculous magazines as you check out at the grocery store) but we DO have the power to do something. This spoke to my heart on so many levels! It's everything I've wanted to express for some time now, but had no idea how to put it all into words. And after reading yours and Natali's back and forth up there, I have to say that I've struggled so long with questioning myself and my own motives and second-guessing nearly everything I've put up on the internet, ever. Actually, pretty much every word I've ever spoken as well. Every post, every tweet, every comment, ever. Until recently when I just got mad at all the 'accusations' flying at me, then declared that I have completely pure motives and I just need the Lord's help with not being so dang condemned all the time about everything. Like, "Lord, make me easy-breezy in every sense of the word, please & thank you. What do YOU think about me?" I need more of that floating around in my mind. Tired of questioning, tired of feeling inadequate... I want that solid, grounded, sound mind, you know? The rest of the little insecurities and weird things will just fall into line after the truth is rooted in my little peanut brain, you know? Because for now it's good to keep myself protected from stuff, but at some point I want to be able to walk into any room with a hundred gorgeous skinny women who made their beds that morning and have a beautiful spotless kitchen and go on vacations to Hawaii every summer and be completely unshaken! Who knows if I'll ever get there, but man, I want that. Anyway, I find it so comforting to know that you and I (and so many others, apparently!) are 'protecting' ourselves in the same ways because seriously, 5 minutes on Pinterest can equal the next 5 days being depressed if you're not careful. It creeps in so subtly and escalates so quickly, those negative thoughts! I have to pick and choose what I look at on Facebook too because even READING the negative posts about ISIS or Obama or how crappy our country is or this person is sick, the drought is so awful, that person just killed so and so... I CAN'T. I don't want that stuff floating around in my brain! It's heavy stuff and you can literally FEEL the weight when you start paying attention, right? That's a big leap for a girl who used to watch Dexter and horror movies all the time, just saying, lol. Love you, my friend! And I love this post. Definitely sharing it on social media, haha! This is the well articulated version of everything I try to explain when I have rambles about the internet and social media! I have constant battles with it, and the comparison that I don't even notice subtly changing my mindset. I think a lot of the pressure and anxiety I put on myself about whether I'm being a 'good' mother or if I'm making the 'right' choice with what we do with our time can come from the subtle messages which people give out (not that they mean to! ).